Wipus since it's creation has focussed primarily on a single RPG game at a time but with the recent shift we are now also aiming to expand to other genres. Planetside 2 is a nice example of that. As most of us haven't really played an FPS in the recent past it might be a good idea to get back in the saddle and start shooting people again. 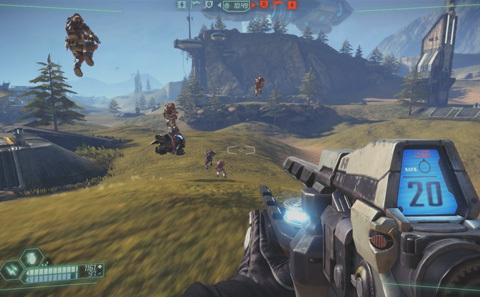 Tribes Ascend might just be a nice game for us to do that in. Tribes Ascend is the follow-up to the well known Tribes 2 and has some of the iconic weapons of that game in it's arsenal. One of those is the Spinfuser, a weapon that shoots slow travelling disks that explode on contact. Hard to aim, but packing quite a punch. Another of it's distinguishing traits is something that is called skiing. You can glide frictionless over the landscape reaching high speeds. This results in frantic and fast paced action and gameplay. There are of course some different game modes available, for example: Capture the Flag, Team Deathmatch, Capture and Hold, but also Arena. The game is F2P and as a result it has an unlock/experience system for upgrading weapons, perks and even new classes. Buying these unlocks with real money is of course how they try to earn their keep, but you can also unlock them with ingame experience. No need to get out the credit card to enjoy the game. As the game is F2P why not give it a go and see if we can get some skills before Planetside 2 will be released. If you want to join us ingame you can sign up and create an account at www.tribesascend.com.